Our Admissions Office supports a holistic approach to evaluating our freshman applicants. We believe there are many ways of measuring your strengths and readiness for college. In that regard, our Test Optional policy offers an admissions pathway for students whose potential for academic success is not accurately captured by standardized test scores. By opting to apply under our test optional policy, you will not be required to submit ACT or SAT test scores. Your application will be evaluated based on your application information, high school transcripts, and admissions essay. In order to be eligible to apply under the Test Optional policy, students must meet a minimum of 3.0 GPA in college preparatory curriculum. Please note that having a 3.0 GPA in a college preparatory curriculum does not guarantee your admission to Walsh University. Almost all of our applicants are eligible to apply test optional, however there are a few restrictions. Please indicate on the admissions application if you plan to apply as a Test Optional applicant. 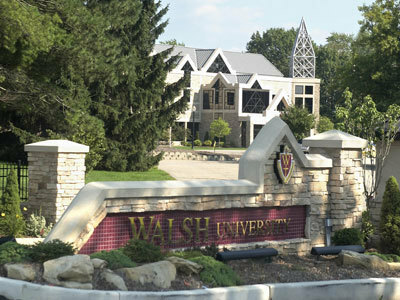 Even if you have sent test scores to Walsh, but subsequently apply as a Test Optional candidate, we will not consider your test scores in our admissions evaluation. Applying under the test optional policy is a personal decision. If you do not feel your test results adequately reflect your academic potential, taking advantage of the Test Optional policy may be your best choice. In order to help you with your decision, below is our student profile from the last incoming freshman class. Recalculation of GPA- English, math, sciences, social studies/history, foreign language, and other college preparatory courses. Rigor of classes according to high school offerings- number of dual enrollment, honors, AP/IB courses taken by student. All students who apply to Walsh are eligible for scholarship consideration and will be reviewed for a merit scholarship during the evaluation process.